Applying for a medical fellowship will require three to five letters of recommendation depending on the particular program. It isn’t uncommon for busy recommenders to allow applicants to write their own LoR which the recommender will then review and sign. Should you be tasked with writing a letter of recommendation for a medical fellowship for yourself you should look at some samples of other LoRs first. Reviewing a fellowship letter of recommendation sample can show you how to structure your own letter and give you an indication of the type of information that should be included. 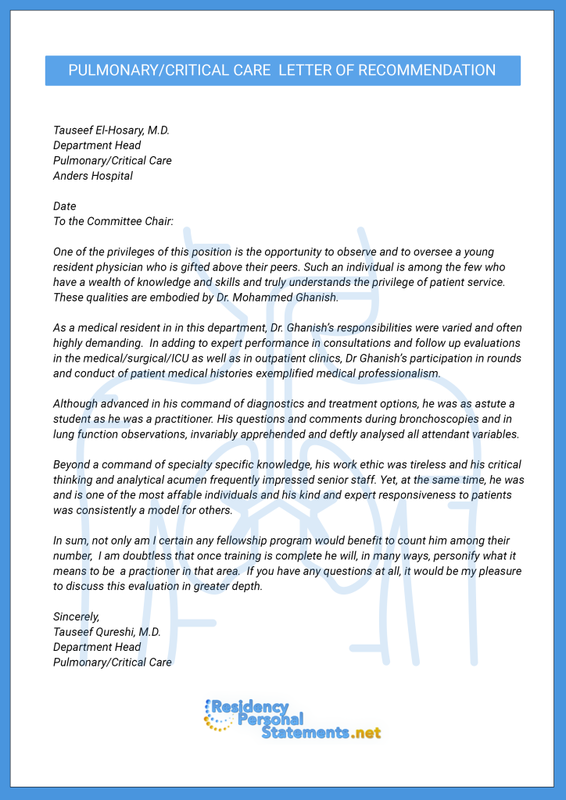 A letter of recommendation for medical fellowship as well as ERAS personal statement format carries a considerable amount of weight with selection committees and program directors. This is a double-edged sword as just as a great letter of recommendation can improve your chances of getting into a program, a less than a great letter can hurt your application. These are three major programs that actually get a lot of appreciation among students all over the world. You can also apply for admission in these universities if meet their required criteria. University of Wisconsin: The successful candidates can get the opportunity of residency training in 3 medical centers. University of Pennsylvania: A popular choice to study Alzheimer’s disease due to the excellently conducted researches and academic studies. University of North Carolina: The 100 different residency and fellowship programs are being offered by the university currently. These are some important requirements for letter of recommendation for the applicants. Try to follow them properly. The submission of letter is only allowed to the letterhead. There is no need to send this letter to anyone else. Try to avoid using a duple or plain paper to write the letter. These can only be typed with no doubt. It is not acceptable to use more than one form for submission. The reader should get the impression that the recommender knows the applicant well and thus has good insight into how they will perform in the program. Provide the context in which the recommender and applicant know each other and the length of time. When possible the recommender should quantify different skills in relation to others they have worked with. Putting a number to something such as “of the x amount of residents I have worked with, the applicant was one of the three to master this technique in this amount of time”. Avoid any vague statements as these tend to be viewed as potential problems. Close with a strong endorsement that leaves no doubt that the recommender is confident in their recommendation of the applicant. Reviewing a fellowship letter of recommendation sample from our service ensures that you have an outstanding LOR to use as a writing guide. Feel free to contact us for fellowship application help at any time. It is always advised to ignore these mistakes to write a compelling letter of recommendation. Stop writing quickly and creating typos. You are supposed to keep eyes on every part of the letter. Start with introducing yourself in an engaging manner. Write the content concisely and go for creating more meaningful content. Let’s follow these hints when working on the letter of recommendation. The expert writers have to say this for you. Make thorough research and collect an adequate amount of data for it. Adding walls of text isn’t acceptable at all. You just have to write the text content briefly. Use unique keywords to make your letter more impressive. Follow the latest templates to avoid making a lot of mistakes. Applying for competitive medical fellowships requires every part of your application package to be the best it can be. Our service excels in a letter of recommendations and help with residency application. The writers we use are skilled professionals with advanced degrees in fields related to the specialty being applied to. In addition, every writer has extensive experience with letters of recommendation as well as the entire residency application process. The letters we provide are always original and tailored to the specific applicant. Unlimited revisions of your LOR at no additional charge. Our writer works with you until the letter of recommendation is exactly how you want it to be. 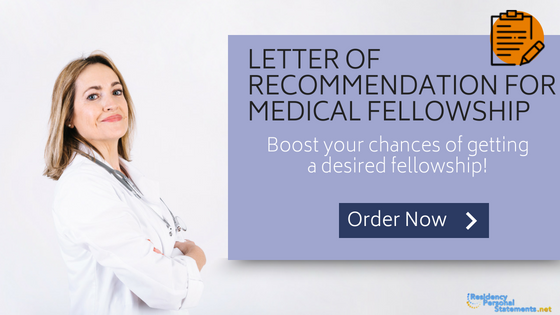 Create an impressive letter of recommendation for medical fellowship with the right help!